Home → Uncategorized → What’s your favorite success story? What role did your channel partner play? What’s your favorite success story? What role did your channel partner play? Jim played a pivotal role in my favorite Channel Partner success story. While I’ve had many, many other Channel Partner success stories, like my #2 favorite win: A $1million deal for CellBlazer data-over-cellular modems to IUSACELL (Mexico City) in 1992 for a non-mobile, local telco bypass (thank you, Butch Dawkins and Daniel Rios), my work with Mr. Sheffler tops the charts. The tag-team of Sheffler & Fox (c.1981-83) was a combination of opposites and similarities. Opposites: Being a foot taller than me, when we walked into a Prospect’s office for a sales appointment I’m sure we looked a lot like Mutt & Jeff. Jim’s casual, good-old-boy nature made him an instant winner with everyone between and including the receptionist to the purchasing agent. He was a terrific complement to my rather egg-headed, fact-gathering style, which worked well with engineers… the folks who designed-in (or designed-out) Intel chips. Birds of a feather: Jim and I had great fun and shared a lot of laughs as we divided and conquered. He was the kind of guy who could speed along the Illinois Tollway at 60 while safely eating a Big Mac, drinking his shake and telling some crazy story about life as a sales guy at Hamilton-Avnet that kept me in stitches. We both seriously enjoyed the opportunity to win new accounts and kick Motorola’s and NEC’s butts. We also respected each other’s role. I brought the product technology edge (and Intel Application Engineers who could make it all work) to customers while Jim worked his magic with the customer’s purchasing department and—most importantly—with Hamilton-Avnet’s credit oligarch. You see, all of my clients were small businesses, most of them startups, who had little or no credit history. Intel would never extend credit to any of them, so unless H-A credit got in the middle of the transaction (and gave the client a “thumbs-up”), neither of us was going to have a meal to put on the table to say grace over. You already know from previous posts that I started my career with Intel as a Field Sales Engineer after graduating from University of Illinois with a CS/Engineering degree. The last segment of my training at Intel (before I got my own accounts and a quota) involved providing tech support to Chicago-area companies. It was a terrific way to come up to speed on the entire product line while getting comfortable talking with customers. 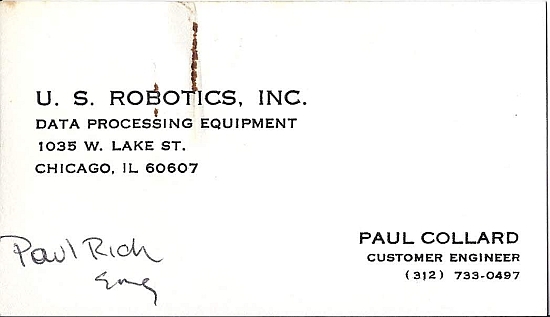 Some time in 1980 I got a call from Paul Collard, one of the founders of U.S. Robotics. He had been reading an article (probably in EDN) about Intel’s 2920 Digital Signal Processor, invented by Ted Hoff (the same guy who invented the microprocessor!). At some point in our conversation we decided on a meeting at their office. I got the O.K. from my manager, and off I went. At the time, U.S. Robotics’ office was on the second floor of a rundown loft. 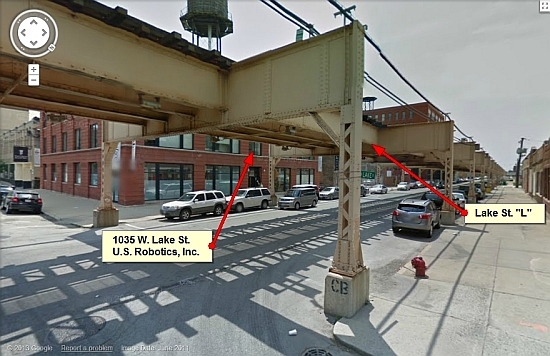 If you’ve watched The Blues Brothers with Dan Aykroyd and John Belushi and remember the scene where the brothers return to Elwood’s (Dan Aykroyd) apartment with a scenic view of the Chicago “L”, you’ve experienced U.S. Robotics c.1980. After arriving on the second floor and shaking hands with Paul, I looked to my left and in the corner of his office was a giant ball (4-ft) of wire. Wire he had scavenged and was left over from various breadboarding projects. Paul regularly sold his wire collections for scrap to continue funding their fledgling company. When the “L” went by, all conversation had to stop due to the noise. (here’s a 39-second YouTube of the Lake Street “L” to prove my point). That’s what a “real” startup is like. Over the next many months, USR became deadly serious about their intention to build their next generation modems around Intel’s DSP. It would be Intel’s first major win for the DSP, which is how I convinced John Rittenhouse, Intel’s resident DSP expert in our Chandler, Ariz. telecom division to fly to Chicago and hang out with the USR engineering team (of two: Paul Collard and Steve Muka, the software microcoder). As things progressed, competitors smelled the chum in the water and started circling. But I had no clue this was happening. I was a naïve (okay, very naïve) salesman who believed that after all my company’s effort, USR would just hand me an order for all their business without a fight. Ha! That’s where Sheffler saved my bacon. While I was blind to all this, Sheffler was befriending the purchasing agent, Igor Boguslavsky. I remember sitting in my office one day when Sheffler charged in with a quote form for USRobotics (below). These guys were out getting competitive quotes and, thankfully, Jim jumped into the middle of it and got me last look. Needless to say, I learned my lesson and fixed the situation with Igor. Jim and I were on our way to an amazing account win. 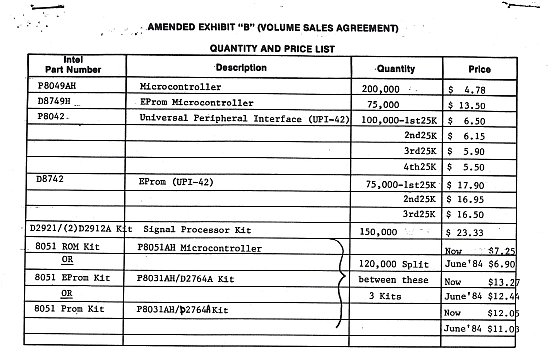 In 1983, USR signed an OEM contract with me for more than $7 million of Intel technology, making Intel the largest telecom supplier of DSP devices on the planet. 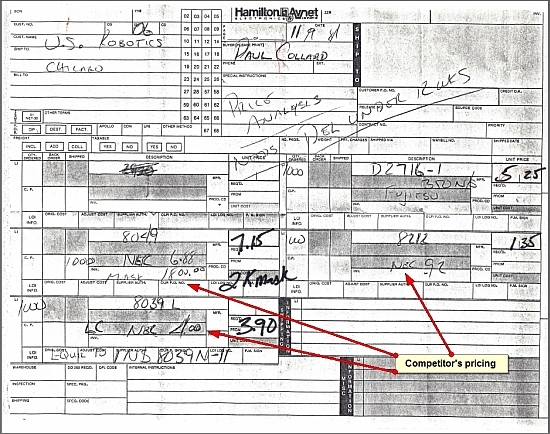 And btw, all those prices in the contract had built-in margin for Jim and his team at Hamilton-Avnet. Seeing a rocket ship on the literal launch pad, by the end of 1983, I joined USRobotics to head-up sales and marketing.